eDiets Meal Delivery Service is no longer available. Have a look at Diet to Go instead. eDiets, as part of their extensive online dieting resources, also offers Diet Smart Meal Delivery Service shipped to your door throughout the USA. eDiets delivery menu is a balanced blend of proteins, carbohydrates, and fats. eDiets food averages between 1000-1100 Calories per day and with recommended serves of fresh fruit and vegetables it would average around 1200 Calories per day. Their Men’s Plan is a little higher in calories at 1300 and men can supplement the diet with dairy and fruit to equal 1600 calories per day. 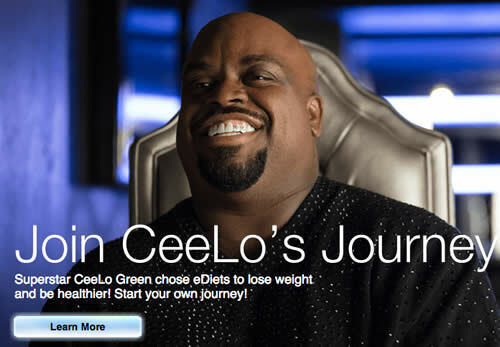 They have recently enlisted the help of CeeLo Green to promote their services. eDiets offers three different delivery options featuring their preservative free Diet Smart flash frozen meals. * All options incur a shipping fee. eDiets delivers a week to 2 weeks’ worth of meals to your doorstep. The food comes flash frozen with standard ice packs in an insulated cardboard box. My order of a week’s worth of food arrived when they promised and was semi-frozen and well packaged. The food was packed by meal so it was easy to sort it out according to the printed menu provided. The non-perishable snacks and desserts were in a separate box located within the main package. All meals were clearly labeled with nutritional and ingredient information. All food was in perfect condition and eDiets recommends that when the food arrives, it is stored in your refrigerator and not frozen as the heating instructions are for thawed meals and the meals have an expiration date of about two weeks from delivery. eDiets doesn’t recollect any packaging materials, however, the food trays are #s 1 and 2 plastics which are recyclable. Most food is packaged in sealed microwaveable plastic trays and the intended reheating method is the microwave. Most meals are ready in about 2 minutes from the refrigerated state. Some of the highlights include the Turkey and Black Bean Chili and the Blackened Chicken Breast with Seasoned Potatoes and Peas. The only dishes I didn’t care for were the breakfast items using the egg substitute. It was more the texture than the taste. The eggs were spongy and somewhat dry. Overall, eDiets provides a good service for those that cannot control portion size and who don’t have time to prepare healthy meals. eDiets recommends incorporating at least 3 serves of fresh fruit and vegetables each day in their plan and gives portion guidelines for this, which is a plus for their plan as they recognize the health benefits of fresh fruits and vegetables. I would have liked to have seen other heating options apart from the microwave as I’m not a big fan of microwaveable food. Because of this, the food really didn’t stand out as much different then microwaveable diet food from the grocery store with the exceptions being smaller portions, lower in sodium, and greater variety. eDiets offers a few desserts such as Ghirardelli chocolate, which will help with dieters who struggle with deprivation.